School holidays are upon us! I’m cheering as I love the change of pace. Mind you, after a couple of weeks I’ll be booing, desperate for a bit of silence and solitude. We all need to know about Sydney free school holiday activities because no family can afford to do paid stuff every day of the holidays. So, here’s my updated list of our family’s Top Ten Cheap and Free Activities for kids. Hope you enjoy it and get some penny-pinching inspiration. NB If you are looking more for shows and events, a complete guide to What’s On School Holidays Sydney can be found over on the membership section HSK Plus, click here to read more and join up. HSK Plus has a huge list of free kids activities, both for school holidays and throughout the year. You’ll save more than you’d ever spend on the membership! The roads are quieter in the school holidays, and we have more time. How about visiting one of Sydney’s bigger playground with a picnic, make a day of it. Playgrounds get you outdoors and so have to be one of the best free kids activities Sydney has on offer! Getting together with a group of friends makes a visit to the playground especially great for Sydney school holiday fun. 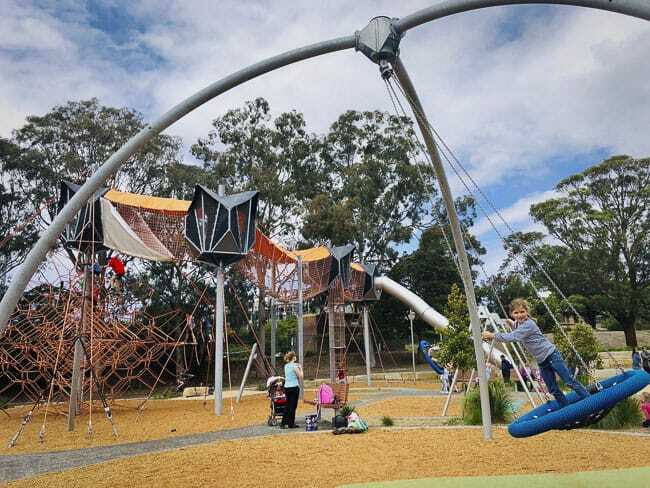 Or check out our Sydney playgrounds map and huge lists on this post. If you can’t be bothered making a picnic, check out the best playgrounds with cafes in Sydney. There are too many great Sydney beaches, find a map here showing all the beaches described in great detail on this website. 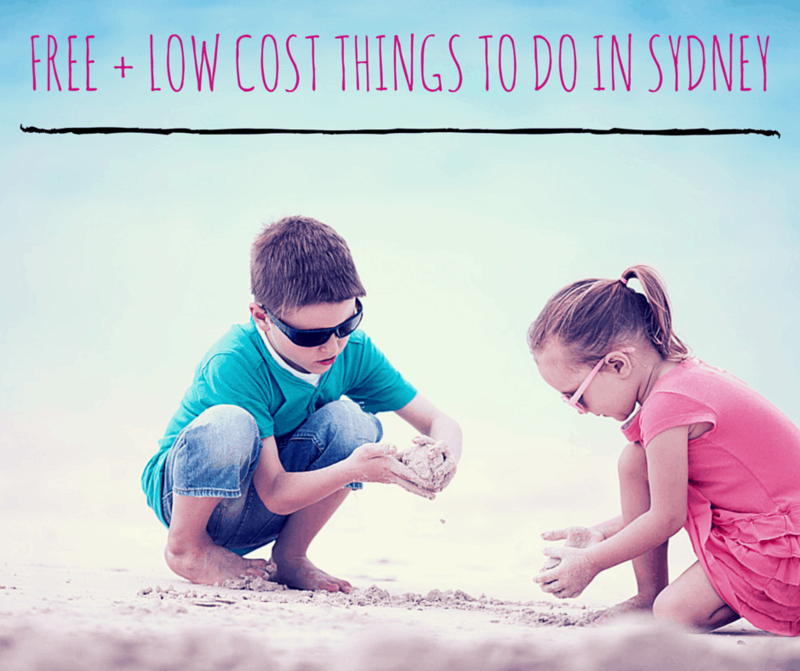 Our family believe that beaches make the best free things to do in Sydney with kids at any time of year. Even in winter you can run wild, collect drift wood, have a paddle… or even swim if you are as mad as us. My favourite beaches for a day out are those that also have a fantastic playground… and even a cafe nearby too. Check them out on the Sydney beaches map post. Some of Sydney’s stunning harbour pools are completely free to visit. Summer for swimming, winter for beach play and paddling, they are great spots all year round. These harbour pools are very beautiful too, which the adults will enjoy whilst the kids run around outdoors, that’s school holiday fun Sydney style. Some Harbour pools do charge a small fee. This year we must get to the lovely Greenwich Baths, and in Balmain the Dawn Fraser Pool, very historic and scenic. Also on the Harbour are some pretty beaches with netted swimming enclosures. 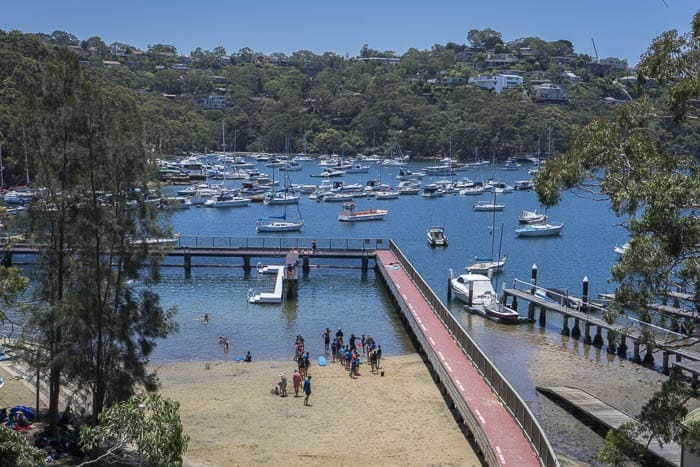 We love Clifton Gardens with its excellent playground, Little Manly Cove which (which has a great cafe) and we need to get back to Shark Beach in Neilsen Park and Parsley Bay which also has a playground, plus a kiosk. It’s been too long! If you want to check out all the best water slides in Sydney, click here. The complete list of swimming pools described on Hello Sydney Kids can be found here. My big boys used to love a day at a bike track with friends. Many bike tracks have playgrounds right beside them, you really can stay for the whole day. Take a picnic and a Thermos of tea or coffee and let the kids ride and run wild all day. Like tracks are another of fantastic free things to do with kids in Sydney and there are dozens to explore. 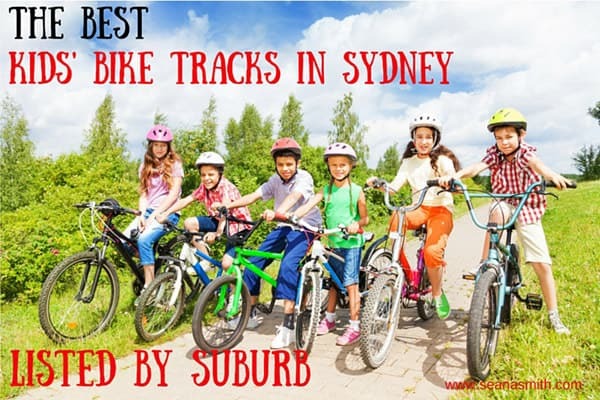 My list of Sydney’s best bike tracks is here. There are several free and low cost activities on offer amongst the more than 50 activities in the Kids In The Park program. Check the program here. 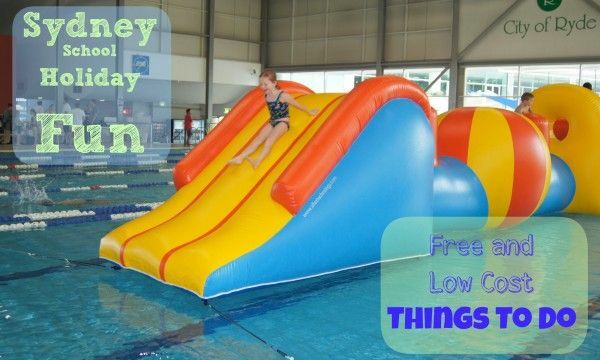 A simple visit to Sydney Olympic Park also makes for fun school holidays activities, Sydney’s premier sporting centre has so much to see and do, much of it cheap and free. Enjoy walks, playgrounds, the huge pool and more: check the Sydney Olympic Park website here. NSW National parks and Wildlife Service runs many child-friendly free and low price events throughout the year. Check them out on the NPWS Wilderquest website. You can also play the award-winning WilderQuest game on computer or on an iPad, check here to read my post on WilderQuest. And it’s absolutely free. Sydney has many great family-friendly walks, and our faves are by the ocean. Let the briny breeze blow the mental cobwebs away! There are great walks for stroller pushers, safe walks for toddlers and more challenging walks for school children too. I have a few walks on the blog, find my child-friendly walks listed here. Use the cheaper books of tickets to keep costs down and BYO caramel popcorn and drinks. If you are taking babies and toddlers, have a look at the great child-friendly cinemas and screenings which happen all over Sydney. Some cinemas have ‘baby crying rooms’ where you can sit with the family and cause no-one any bother. Others have specific screenings where no-one will complain if your toddler starts rummaging around under the seats or your baby starts squawking. Find my list of them all here. As my kids got older, we also enjoyed staying at home more. The kids could run and play in the cul de sac and we also enjoyed baking and doing crafty things. 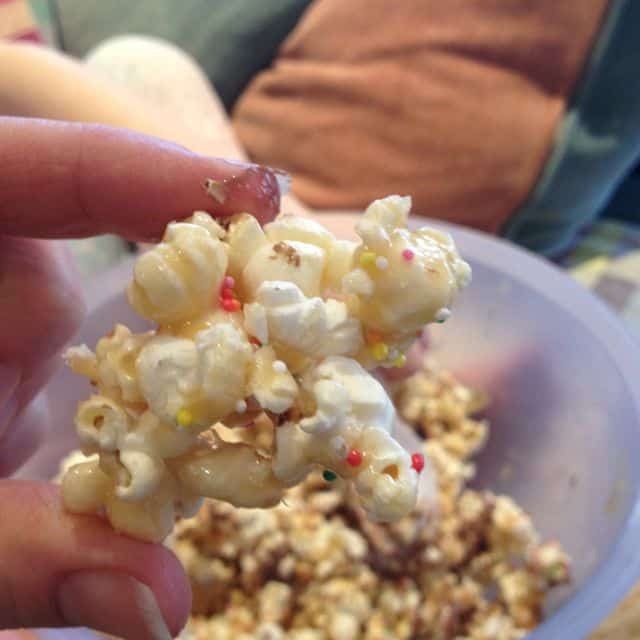 We might bake a healthy chocolate cake… or a beetroot and chocolate cake.… or some spiced zucchini bread.… actually we might just give the healthy option a body swerve and get straight into some caramel popcorn. Movie time! On a sunny day my kids still love drawing all over our windows using liquid chalk which we get from Smiggle shops. So there you go, no need to wonder what’s on in school holidays in Sydney, the free stuff is here and you can find a complete what’s on listing plus more free events and activities over at HSK Plus. Catch you when term starts back. Great list Seana! Will share with my Sydney mates. Thank you Sonia, we fly up to Queensland tomorrow – can’t bloomin’ wait. Enjoy the hols. How funny that you should have a head shot of Ryde Aquatic centre. We were there on Thursday. I even went in. The kids had a ball and it was such a cheap day out. Didn’t even have to pay for parking. And great to see Olympic venues being turned over to the people for the greater good. brilliant. Yes, pools are the best, winter and summer, sunshine or rain for us… they wear the kids out at bargai prices, big win for us. Thank you… we have come away on holidays but I will be using this post when we get back as we’ll be broke! Hello, no affiliate link, it’s all thank to Rich Candy at Mucho.com.au who made sure it loads fast. Thank you so much, you’re very welcome here! Wow what a great school holiday resource this is. There is so much to do in this town and lots of it free. Awesome list Seana!!! I have shared it on FB with my readers. We are always looking for low cost activities to keep our little one entertained!!! Thanks Shelley, it’s far too easy to spend loads of money in school holidays. Fresh air fun is cheap!